The latest issue of The Great Outdoors is in the shops now. 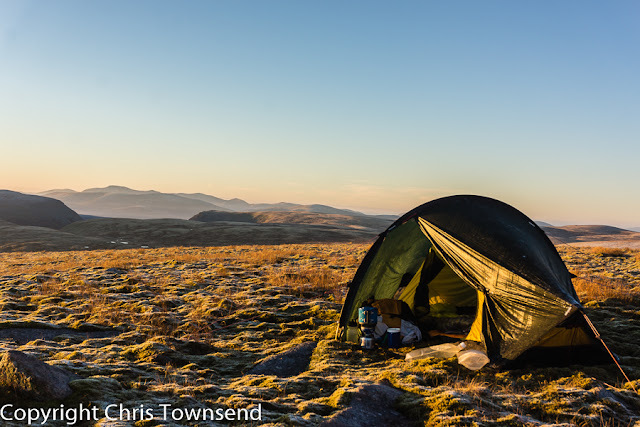 My backpacking column is about the pleasures of autumn and winter camping. Midge-free and you can see sunset and sunrise without losing sleep! In the gear pages I test 12 base layers, just in time for the first really cold weather and review two GPS watches plus have a look at smartphones for outdoor use and navigation apps. In the same feature Will Renwick and Emily Rodway review three standalone GPS devices. Will Renwick also has a first look at Keen's new Liberty Ridge boots. Pictures in this issue include a very dramatic double-page photo of Knott Rigg in the Lake District by Damian Shields; a surreal and evocative photo taken inside a snow tunnel in the Cairngorms by James Roddie; and some photos of mine of Suilven and other Assynt hills. Also well-illustrated are David Lintern 's story of packrafting down Loch Mullardoch, camping on an island, and climbing the surrounding Munros; Ray Wood's account of bikepacking the Trans Cambrian Way; and Carey Davies trip by train to go walking in the Pyrenees. Elsewhere in this issue Keith Fergus suggests some ascents of the smaller hills in the Trossachs, and there's a look at other lower hills in the UK; Ed Byrne goes out filming with Terry Abraham and with Countryfile; Carey Davies ponders urban living as he prepares to move to Sheffield; and Roger Smith wonders about the value of the forthcoming climate change summit. In the book pages Jim Perrin praises Frederic Gros' A Philosophy of Walking and Roger Smith reviews A William Condry Reader, edited by Jim Perrin. The Hill Skills pages are about staying safe with good pieces by Glenmore Lodge instructor Kevin Rutherford; Mountaineering Council of Scotland Safety Advisor Heather Morning; and Northumberland National Park Mountain Rescue Team Leader Iain Nixon.